Built in 1904, the Westin St. Francis is one of San Francisco’s great historic hotels. 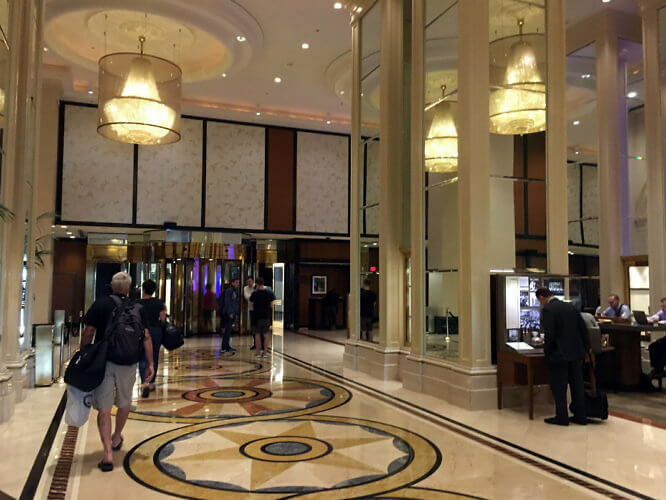 The grand dame has been refurbished many times over her lifetime, including a her biggest facelift ever: the recent $45-million renovation of the 618 guest rooms, 4 suites, and 12 floors of the hotel’s Landmark Building. The hotel actually has a total of 1,195 guest rooms, including 41 suites, and if that sounds big, it’s because it is. The Westin St. Francis is Las Vegas-style big and its sheer size and grandiosity were the first things I noticed upon arriving at the hotel. At 3pm on a Friday, there was no line for check-in (though the velvet ropes and stanchions snaking their way to the check-in desk indicated that there might be once the official check-in time of 4pm rolled around). My room wouldn’t be ready for a few minutes, but I was offered a card for a complimentary drink in Caruso’s, the bustling lobby cafe and bar, where I watched the action of so many guests coming and going and admired the hotel’s unique touches, like the words “Weekend Welcome” projected onto the shining marble floors, and the beautiful Great Magenta Clock, a recreation of the one that graced the lobby since 1907. The theme for the renovation of the Landmark building was inspired by San Francisco’s nickname as “The Paris of the West” and throughout the refurbished floors, these influences abound, from the Art Deco-inspired brass light fixtures and crystal chandeliers to the striking photos of the city, to the color palette of soft grey with accents of deep Parisian blue, goldenrod yellow and peony pink. 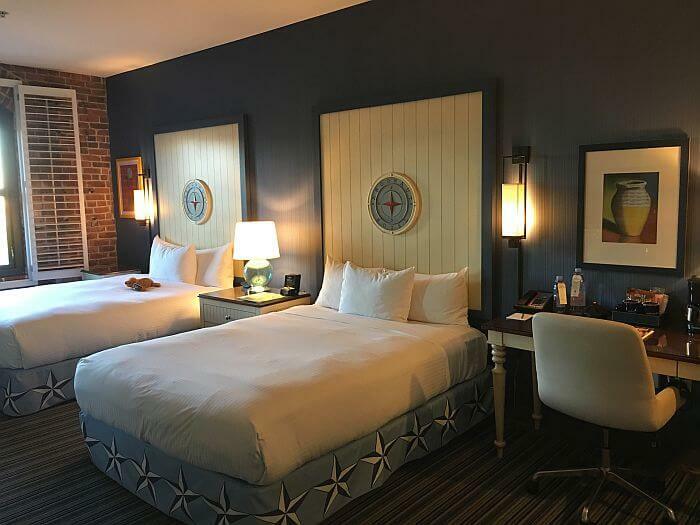 Inside the newly updated rooms are the same colors and accents: crown and panel moldings, blue and silver accent walls, rich Parisien blue velvet armchairs, upholstered headboards, crystal chandeliers, quartz bathroom countertops, marble floors, and chrome fixtures. The end result is strikingly modern while evoking the spirit of Paris at the turn of the century in all ways but one: the size of the room. I was shocked at the amount of space in my room, a 330-square-foot Grand Deluxe King. In addition to the King Bed, work desk, and a dresser with a flatscreen TV mounted above it, there were two chairs and a side table, and a loveseat with coffee table, and that still left enough room that we could have thrown a cocktail party and invited a dozen of our friends to mingle and no one would have felt cramped. The room’s modern conveniences aren’t forgotten, either. 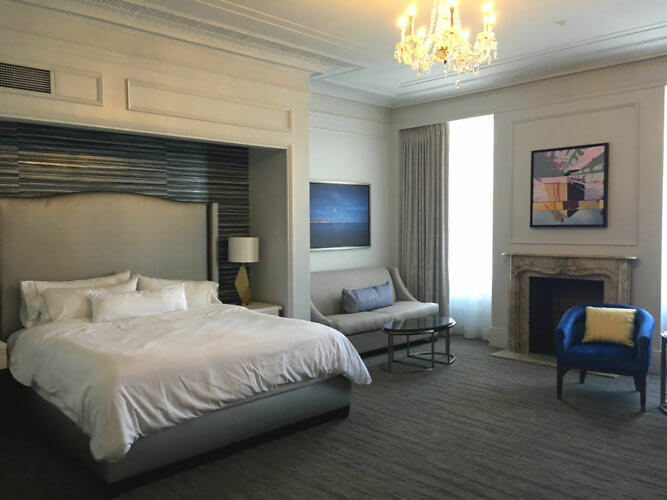 Each room has the signature Westin Heavenly® Bed with 250-thread-count sheets and duvets, SMART TV systems, mini-fridges, individual climate control, hair dryers, and safes. 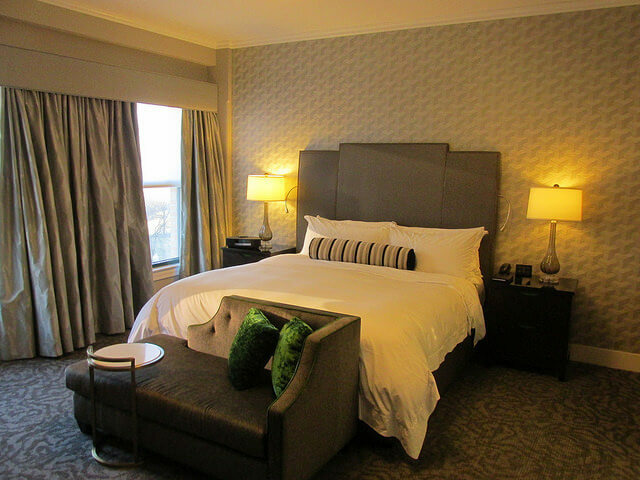 Onsite, there’s a fully equipped Fitness Studio and Business Center, a Westin Kids Club, Concierge, Oak Room restaurant, and Michael Mina’s Clock Bar, which on the Friday night of my stay was packed to overflowing. 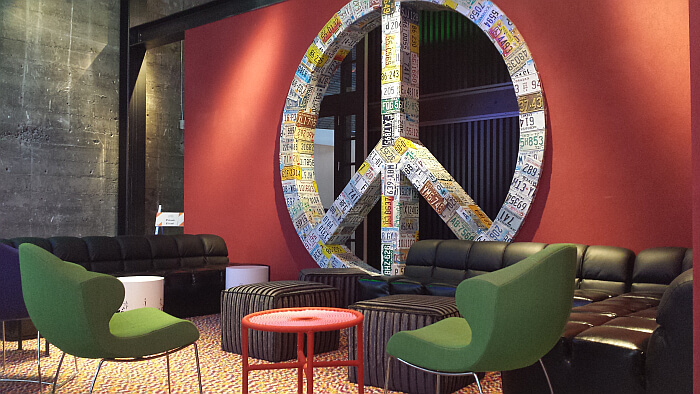 There’s good reason the Westin St. Francis has been around for more than 100 years. 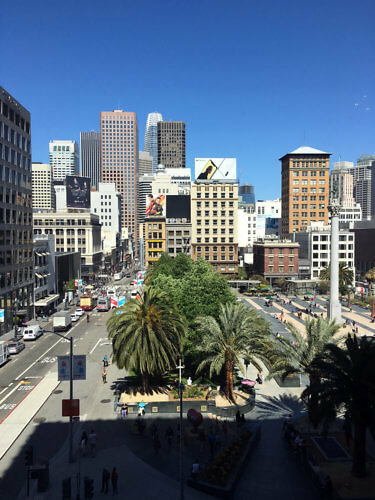 It’s in an absolutely prime location, right on the edge of Union Square (and with fantastic views onto the square from many rooms), steps from the Powell cable car line, close to BART and Muni lines, and short stroll to many of the city’s top attractions. But, I was surprised by a few oversights in service. When my husband and I were craving a late night snack, we didn’t find anything on the in-room dining menu that struck our fancy, so we ordered out. Assuming our delivery would arrive sans plates and silverware, we called room service to see if they could help us out; the staff member who answered the phone seemed a bit put out by the request, quoting nearly an hour to deliver the items. While I understand a room service meal taking that long, it seemed preposterous that it would take equally long to send up a few plates, forks, and knives. Even more preposterous: they never arrived. 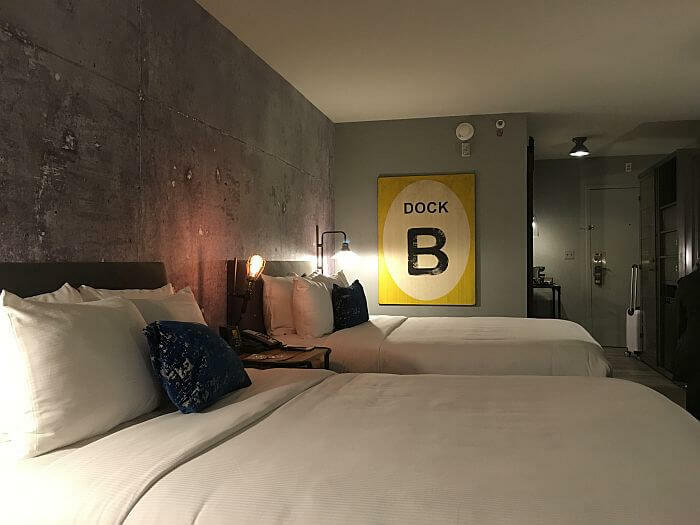 Service blips aside, I found the newly renovated hotel to be beautiful, comfortable, and modern with a deeply rooted sense of history and place. 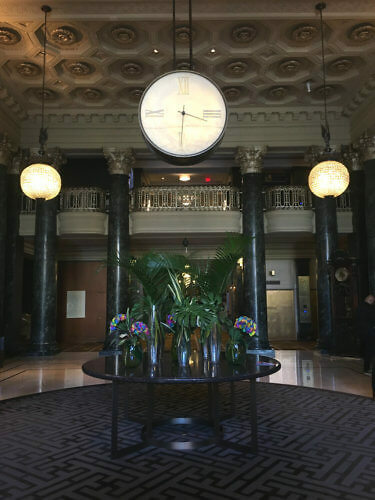 It’s easy to see why this landmark hotel hotel has stood the test of time, and why it will continue to be one of the city’s top hotels for years to come. Room rates start at around $239 per night. Check all rates directly on the hotel website and compare rates at the usual booking sites such as Priceline or Hotelopia. I was a guest of the Westin St. Francis, but all opinions are my own.